Some very exciting news from Film Score Monthly. 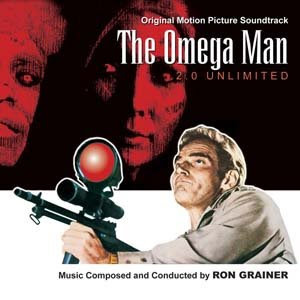 The long out of print, CD limited edition of Ron Grainer's superb score for The Omega Man is being re-released. Currently going for silly prices on eBay, the original edition is highly collectable and much sought after. Lukas Kendall and Jeff Bond, the producers, decided that the money from copies sold on eBay would be better off in their pockets and, more importantly, they both had a desire to revisit the mastering of the CD. The second edition is a completely new master, including some organ overdubs that were missed off the last remastering of the score. The new CD will not have the liner notes and track commentary and the bonus track of Grainer conducting the children's choir so hold on to your original copy if you have one. If you didn't get hold of this last time, do not fear because all the liner notes are available online at the FSM website. The CD is available to purchase HERE and the superb liner notes and an introduction to the remastering and restoring of the score can be found HERE. My original review is available HERE. I am now removing the download version from the site as my policy is only to make available material that is out of print or extremely hard to find.